Swimba is one of the exciting PABA programs, and is new innovative and so much fun. The classes have a vibrant vibe with Latin music and a combination of Salsa, Aqua aerobics for the parents and Aquababies swimming moves for the children. The classes can be taught with you and your child. If you prefer, it can be taught just to adults as a fun fitness class so you can enjoy YOU TIME which is so very important for new parents. The concept of parents working out with their babies was born out of spending thousands of hours swimming with parents, listening to their concerns, observing them move in the water and recognising that they were already exercising. There was a universal desire to regain their figures and keep fit, but many could not or did not want to leave their babies. Hence this program was created, enabling mothers to engage in a mutually beneficial exercise program with their babies. 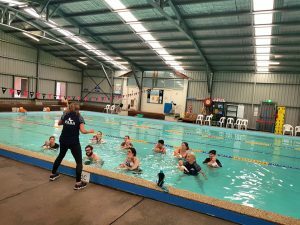 Our experience of developing and delivering successful baby and toddler swimming programs for the past 25 years has given us a unique insight into this market. Parents are always commenting that they are getting a work out too during the classes, an unexpected bonus. We are constantly evaluating our swimming program in our desire to be the best and it was through this process that we began to look at how we could incorporate more structured exercise into the baby swimming classes and so Parent & Baby Aqua (PABA) was born. We aim to be the first call for all programs in the areas in which we operate and to become the overall market leader nationally. We will target a customer base of new parents and offer them reasonably priced, good quality, PABA courses. Adults will learn how to exercise with their children whilst introducing basic breathing exercises, water safety and confidence techniques in a safe and clean environment. Parents can also keep fit with our innovative programs.